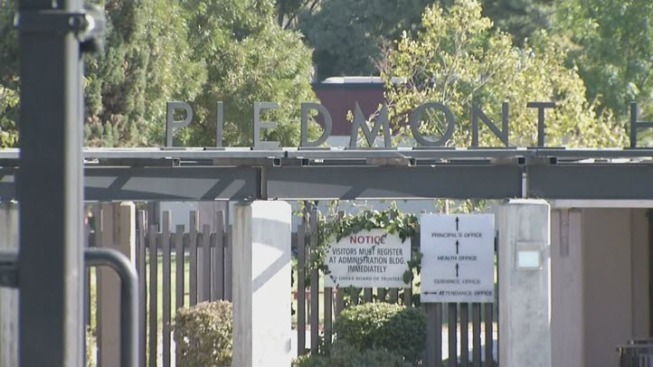 Piedmont Hills High School in San Jose went into shelter-in-place mode Wednesday morning after a former teacher allegedly ignored a restraining order and showed up on campus. The former social science teacher, Arnold Glaubitt, has a court restraining order that prevents him from going on campus. Students and staff stayed indoors until police arrived and arrested Glaubitt for violating the restraining order. East Side Union High School District officials described Glaubitt as a possible stalker, trying to contact former co-workers so persistently and aggressively that the district obtained the restraining order. Glaubitt trespassing onto school grounds is a common occurrence, district officials said. According to the district, a prior arrest did not stop the unwelcome visits, or what they called his unpredictable, erratic behavior. "Of course you're concerned that it would escalate into more than it has to this point," said Cari Vaeth, associate superintendent. Parents said they were unnerved by the incident after being notified by the school. Law enforcement sources tell NBC Bay Area Glaubitt was also arrested at the school last Thursday, Sept. 22, for violating a court order and was released Wednesday morning. Glaubitt on a website claims he is the victim of "gang stalking" and "mobbing" when he tries to talk to former co-workers, mainly to warn them about what he calls "rampant child prostitution" that he has observed. "Everybody's on heightened alert and making sure that the students are safe," Vaeth said. Extra security is also on campus, school officials said. Sources tell NBC Bay Area Glaubitt is still being processed in jail. School officials said they have been told Glaubitt has a court date on Oct. 8.